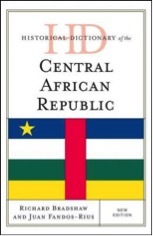 A revised edition of the Historical Dictionary of the Central African Republic (Rowman and Littlefield) was published this year by Richard Bradshaw and Juan Fandos-Rius. The volume will be of interest to Grace Brethren circles since the CAR represents one of earliest and most successful mission endeavors among the Brethren. Bradshaw and Fandos-Rius provide biographical summaries of many missionaries who were well-known among Grace Brethren churches—including James and Florence Gribble, Wayne and Dorothy Beaver, Mabel Hamilton, and Estella Myers. According to Fandos-Rius, Eddie and Linda Mensinger, who formerly served as missionaries to the CAR, helped with biographical information on these Brethren missionaries. The volume will be of interest to Grace Brethren circles since the CAR represents one of earliest and most successful mission endeavors among the Brethren. Bradshaw and Fandos-Rius provide biographical summaries of many missionaries who were well-known among Grace Brethren churches—including James and Florence Gribble, Wayne and Dorothy Beaver, Mabel Hamilton, and Estella Myers. According to Fandos-Rius, Eddie and Linda Mensinger, who formerly served as missionaries to the CAR, helped with biographical information on these Brethren missionaries. The volume is available from the publisher here.